Over the coming days, I will be writing three new posts about my dessert experiences in New York City. This trip was planned as a birthday get-away for Mie, Teresa and myself (my birthday is still 4 months away). We have been friends ever since high school and their friendship means a lot to me. I would also like to thank Matt and Phillip for their friendship, hospitality and for always recommending new and wonderful places. I had a fantastic time in New York, sleeping-in, eating and most of all hang out with friends. If you are interested in other places to go to in New York, check out my first five posts written in May, 2006. Serendipity: to make discoveries, by accident and sagacity, of things not in quest of. I first saw the film Serendipity in 2002, the summer I came back from grad school in London, I never heard of it while I was England. For all those who haven’t seen it, it is a romantic comedy starring John Cusack and Kate Beckinsale where they fall in love by chance. My sister made me watch it. Anyhow, there is a scene where they meet up at a restaurant in New York named Serendipity. Serendipity 3 is a fun and accessible restaurant, which brings up memories of comfort food and childhood favourites such as hot fudge sundaes. I’m not sure whether it was the movie or their reputation, but this restaurant can be difficult to get into. On two other visits to New York, I had planned on eating there, but the lines to get in were unmanageable. On this trip however, my friends and I were able to get in within 10 minutes of waiting in line. 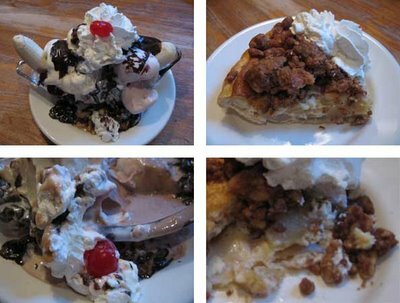 Once we were in, we ordered the “coward’s portion” of the banana split as we didn’t think we could eat the ridiculous amount of ice cream in the “outrageous banana split” and the “big apple” pie. The frozen hot chocolate, I have been told is the drink to get. All their ice cream creations are made with Häagen Dazs. The reason why I think this restaurant does well, is that it plays on our sense of nostalgia. Our dessert at Serendipity was simple and enjoyable. However desserts like sundaes and banana splits are things that I rarely indulge in. 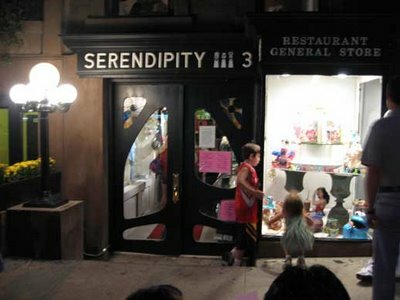 I would recommend Serendipity 3 if you were looking for comfort food, desserts or a bit of nostalgia, otherwise don’t bother braving the line. Posted by Sam at 12:47 p.m.
Ah, Serendipity. The frozen hot chocolate is beyond good. I have *got* to get back to NYC soon! Sadly I didn't try it! I have heard wonderful things about it. So next time I'm NYC... frozen hot chocolate it is.